The original opening line to this review was “What do you get if you mix Adam Christopher’s Empire State and Downton Abbey?” I still like it as an opener, but it doesn’t really come anywhere close to conveying exactly what Between Two Thorns is. 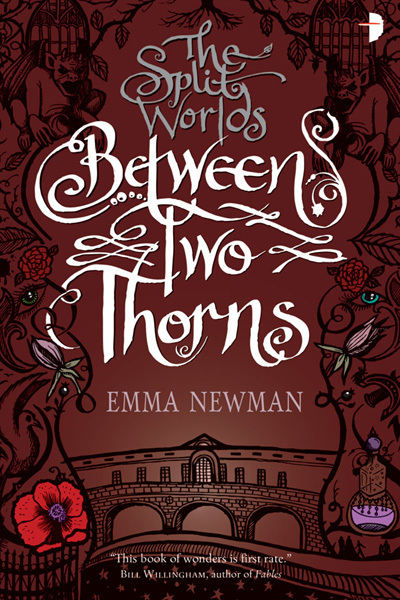 Between Two Thorns is the first full length novel set in Emma Newman’s Split Worlds universe. She has been writing and releasing short stories set in the Split Worlds for free online, but Between Two Thorns was my first introduction to the setting. The Split Worlds are made up of Mundanus (our world, where the mundanes or normal people reside), Exilium (a prison constructed for the Fae lords), and the Nether (a place in between where people never age and society is set back a few hundred years). The main plot is made up of several stories. The main story concerns Cathy, a teenage girl who escaped the Nether to live as a free woman in Mundanus. In many ways, she’s the audience surrogate character, but also a strong willed protagonist in her own right, who never seems to be more than three thoughts away from a nerdy reference. When she is found by Lord Poppy (her family’s patron Fae lord), she is forced back to Mundanus and launched into a political marriage to a man named William. The other story concerns Max, an Arbiter of the Split Worlds (kind of like a policeman), and his soul, which was displaced into a gargoyle in London. They are investigating the disappearance of the Master of Ceremonies (Cathy’s uncle) from Aquae Sulis (the Nether version of Bath), and the only witness seems to be an intoxicated mundane called Sam. It’s not as complex as it all sounds. As previously mentioned, the readers are given a window into this world through Cathy, who helps to keep things grounded. To give an example there’s a part where someone balks at moving between Exilium and the Nether, since the door is on the floor in Exilium and on the wall in the Nether, with gravity adjusting itself appropriately. My cultural touchstone was, of course, Portal, so I was delighted to see Cathy’s next line was to reference Portal. It’s the sort of thing that helps the audience engage with the character, and is thankfully not overdone. My favourite characters, however, were those of Max and the gargoyle. Due to Arbiters needing to be impartial, their souls are displaced and stored, but due to an accident, Max’s ends up trapped within a living gargoyle. What resulted was Max being the logical straight man, and the gargoyle having all the emotions. Paired with a detective story, the whole thing results in almost a buddy cop plotline, which managed to be hilarious and touching in equal measure. With society in the Nether being set back so far, there are a lot of different themes at play, the most notable of which is the casual sexism Cathy sought to escape. Women are expected to wear dresses and fawn over their husbands and not get an education. The third protagonist in the story is William, the man who Cathy is expected to marry. Seen through her eyes, Will is stifling and arrogant; he’s a man she wants nothing to do with. But the genius of what Emma Newman has done here comes through in Will’s own passages. He’s not a bad guy, he’s just a man raised in a patriarchal society. What Cathy sees as him being stifling is him trying to help in the only way he knows how due to his upbringing. Together, they’re a fascinating pairing to read, and I look forward to reading more of them in future books. That all said, while I loved the majority of my experience with Between Two Thorns, there were a couple of things that held it back for me. The first, and most notable, is that it took until some point over the halfway point of the book for me to get a real idea of the Split Worlds and the real differences between them. I do appreciate Newman avoiding the tendency to bog her story down with exposition, but a little more description of the society and the world they inhabit at the top of the story would have been welcome, since there were a couple of points where I felt lost and wondered if I should have read the short stories leading up to the novel’s release. The second issue, and much smaller, is an early break up scene between Cathy and her mundane boyfriend Josh. It’s hard for me to pin down exactly what it was about the scene that struck me as disingenuous, but he just sort of seemed to accept her random turn of personality without much of a fight. I imagine it was done this way because a much longer break up scene would be no fun to read, and would risk alienating readers early on. Nevertheless, it was a small annoyance, and the characterisation was strong throughout the rest of the book. All in all, Between Two Thorns is a strong debut, and a solid introduction to a massive world. Over the course of nearly 400 pages, I fell in love with Emma Newman’s well written and well rounded characters, and I can’t wait for book two so I can learn more about the worlds they inhabit. This entry was posted in Book Reviews and tagged Between Two Thorns, Books, Emma Newman, Fantasy, fifty books, review, Split Worlds, The Split Worlds by Chris. Bookmark the permalink.